Monthly Brief - Is the Permian a Bargain Basin Yet? Is the Permian a Bargain Basin Yet? The dramatic decline in oil prices during the last few weeks has left some investors in shock and others looking for bargains. Moreover, the head of OPEC, Abdalla Salem el-Badri, says no oil price target has been set. At this time, oil prices continue to fall. The current West Texas Intermediate (WTI) price of $56 per barrel is a decline of nearly half from its high. The severe pullback in prices caused by excess supply stings oil producing companies and separates them based on the strength of their balance sheets. Most companies in the U.S. and overseas were already announcing lower capital expenditures for next year. The low oil price will force further contractions. However, wells will not shut in: those are already producing will continue to do so, which means U.S. supply will not contract immediately. One of the lowest-cost U.S. oil regions is the Permian in West Texas and eastern New Mexico. This month's article and spreadsheet is an analysis of public companies with significant operations in the Permian. 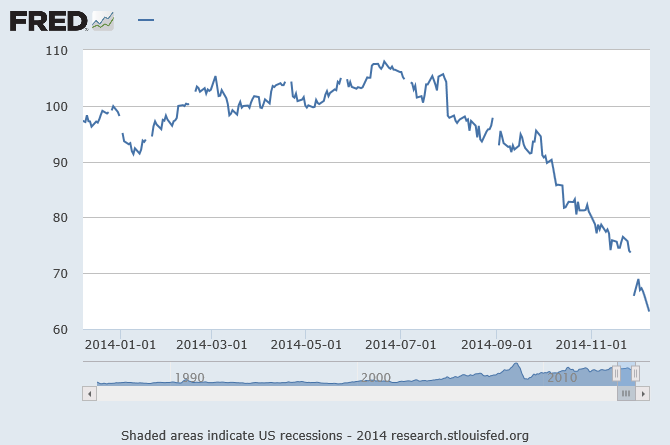 The graph below shows dollar-per-barrel WTI prices.